After a not-so-good performance at Pan Am, Maxime Brinck-Croteau hopes to complete his fencing comeback at the Rio Olympics. Canadian athletes won more than 200 medals in the front of home crowds at the Pan Am Games in Toronto last summer. Unfortunately, Maxime Brinck-Croteau wasn't one of them. The fencer from Markham, Ont. was eliminated early, shut out 15 to 0 in one of his matches. Afterwards, he called his performance "shameful." This summer, he's going to get another crack at the podium. Last weekend, he qualified for the 2016 Rio Olympic Games with his performance at the Westend Grand Prix tournament in Budapest. Brinck-Croteau says the comeback is not complete, but it's headed in the right direction. "It's a dream come true, since I was 11 years old," he said. Brinck-Croteau has always been something of an underdog. He described himself "very chubby" and not athletic as a child. "My parents were pushing me to do sports — I did soccer, I quit. Baseball, swimming, judo, taekwondo, I quit a bunch of sports," he said. "Their last hope was sword fighting." 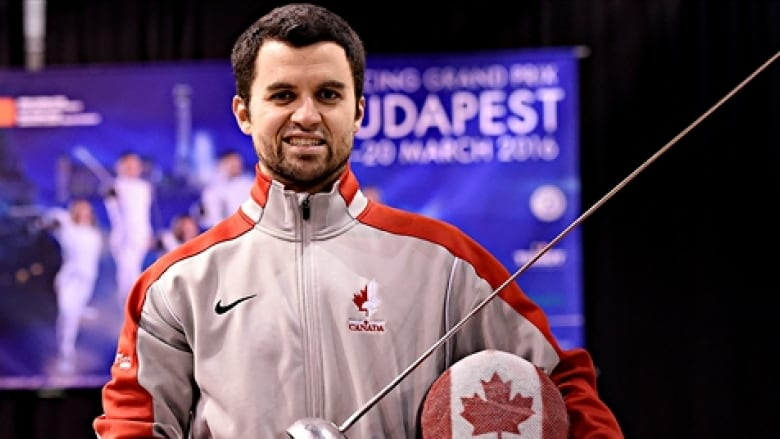 Brinck-Croteau started fencing at the age of 10 in his hometown of Gatineau, Quebec. 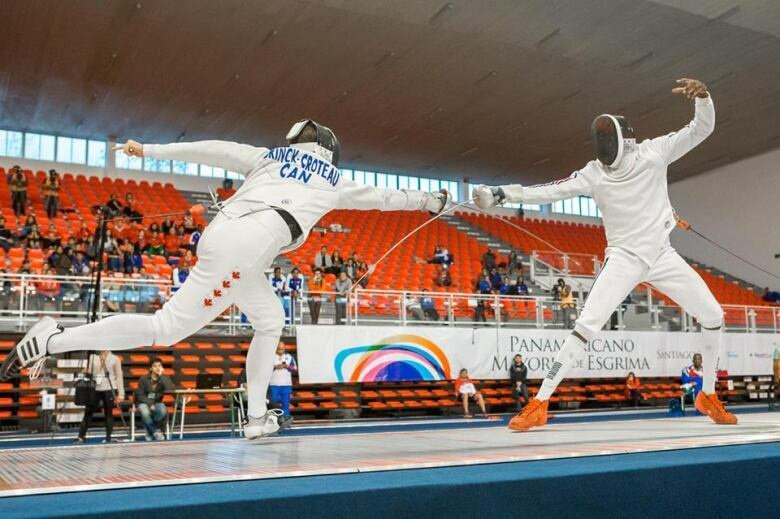 He likens fencing to "physical chess" — more about strategy than physical presence. "You can have tools other people don't have. Tall people can win, short, slow, fast, strong, weak. It's all about the tools you have, and to manipulate your opponent," he told Metro Morning host Matt Galloway. The physical tools that Brinck-Croteau does have is his small sword, or épée. The word has French origins because France refined modern-day fencing into what it is today, and the word itself derived from 19th century Épée de Combat, or sword of combat. His épée weighs about three quarters of a kilogram. The object of fencing is to poke an opponent with 750 grams of pressure — enough pressure to draw blood, though of course, no opponents are wounded in this sport. "The problem is, you have an opponent who has an épée in his hand and he doesn't want to be stabbed. And that's where the fun starts," said the 30-year-old fencer. But "fun" is not how many would describe it. Fencing is a sport that requires intense concentration. Brinck-Croteau will consistently lose if he thinks too much about the match, he said. To clear his head, he listens to music before competing. "No matter your shape or training, it gets pretty stressful," he said. Brinck-Crouteau has done his fair share of losing. Mention the 2015 Pan Am Games and he automatically acknowledges that. "I got crushed under the pressure," he said of his performance in Toronto, his new hometown. He said fans were cheering him on as if he was Wayne Gretzky, and he was caught off guard by it. He's used to being the underdog. "Everything was fine — technique, fitness, everything was fine. And I still lost 15-0, in front of family, friends, colleagues, students," he said. "For me it was the first time with really high expectations." So from now on, he said he's just fencing for fun. "As douchey as it sounds, just ignore the crowd and go with your plan," he said of his new motto in fencing. "At the end the day, all the athletes, we do this for fun. We don't do this for a job or we don't do this to bring food for our family, we just do this for fun." And when Brinck-Crouteau heads for Rio this summer, that'll be the only change he makes. "Same expectations, just different approach," he said.